Second Republic lawmaker and prominent northern politician, Dr. Junaid Mohammed, has said “President Muhammadu Buhari and his people have perfected corruption more than any previous administrations,”claiming that the President deserves a platinum award for corruption. While alleging that the ongoing fight against corruption is designed to fill the pockets of the President’s relatives and friends, he stated that those who are related to Buhari have become billionaires overnight. Speaking in an interview with ThisDay, the Russian-trained doctor wondered the award which national leader of the All Progressives Congress, APC, Asiwaju Bola Tinubu, would now give Buhari having sarcasticly honoured former president Goodluck Jonathan with a gold medal for corruption. 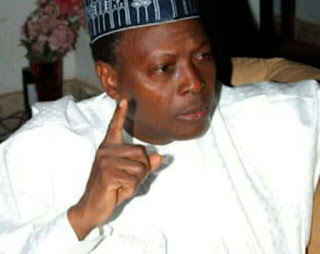 Junaid said, “Buhari has ruined the national economy; he has messed up the national security; he has lied through his teeth about integrity by promoting and supporting people who have no gravitas –those who’re related to him that have become billionaires overnight. On what basis did they become overnight billionaires? Simple: on the basis that they are related to him. Buhari cannot win a free and fair election in 2019. I challenge Buhari to tell me one thing he has done for this country. If he got re-elected, it might be because of tribal sentiments or geopolitical sentiments”. “Talking about the gold medal award for corruption to Jonathan, I think he richly deserved that. It is nothing but sarcasm and of course, Tinubu has a tremendous sense of humour. So, if he sarcastically gave gold medal to Jonathan, I don’t know what he’ll be willing to give Buhari… because Buhari and his people have perfected corruption more than any previous administrations in the country. I will award Buhari platinum (in corruption) because it is higher than gold. I’ll offer him platinum,” he asserted.